Very dated 1970s-style bathrooms – think pink and cream color schemes and mosaic monograms – were in need of modernization in this traditional home in suburban Wynnewood. The client wanted to capitalize on abundant natural light with a neutral color palette and simple, sophisticated materials. In total, inHabit renovated three bathrooms with a similar emphasis on clean lines and calm design. 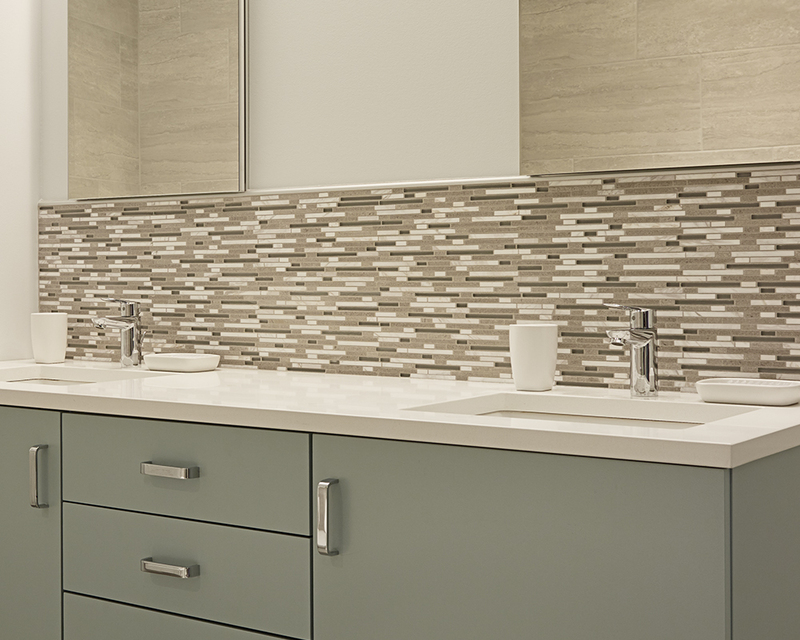 A shared hall bath for the homeowners’ two grown children and a guest bath were updated with floating custom vanities, soft gray porcelain floor tile, and mosaic backsplashes featuring a mix of slender horizontal natural stone and glass tiles. In the hall bath, plumbing was reconfigured to provide improved functionality and better use of space. 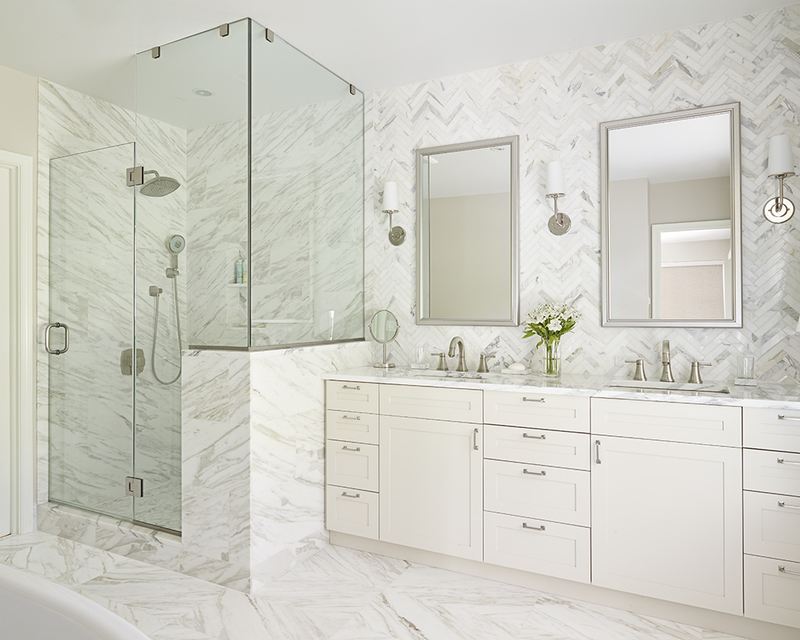 The master bath upgrade featured extensive use of natural Calacatta gold marble to lend visual interest and texture without introducing color. 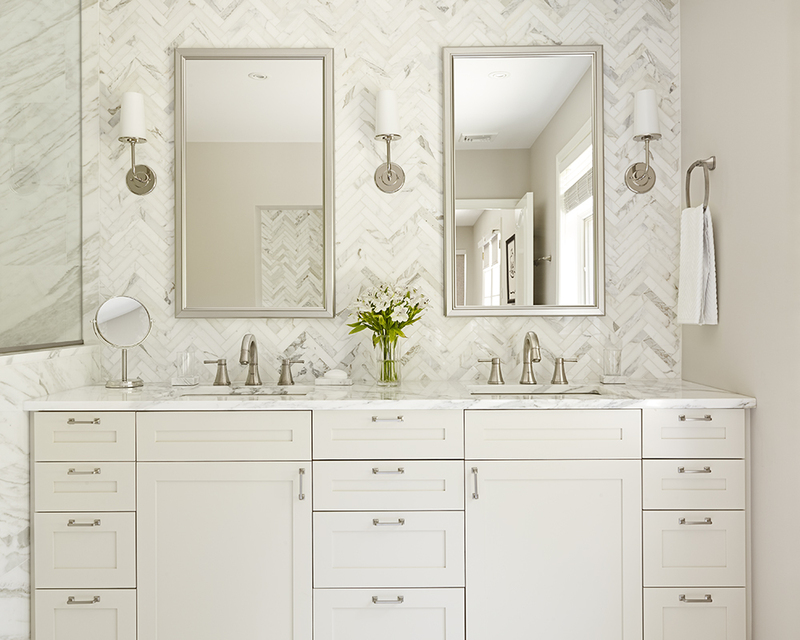 Marble tiles in a herringbone pattern accent and provide a backsplash for the dual vanity wall. Large-format marble slab tiles in a reflection pattern provide subtle dynamism on the floor. The soft warm tones of the marble are picked up in the cream color of custom painted cabinetry and neutral wall paint. Most of the plumbing remained in its original location but was updated in form and function. An enclosed stall shower was enlarged and visually expanded with glass wall panels. A former sunken tub – complete with supporting structure that intruded into the room below – was removed in favor of a sleek new soaking tub. 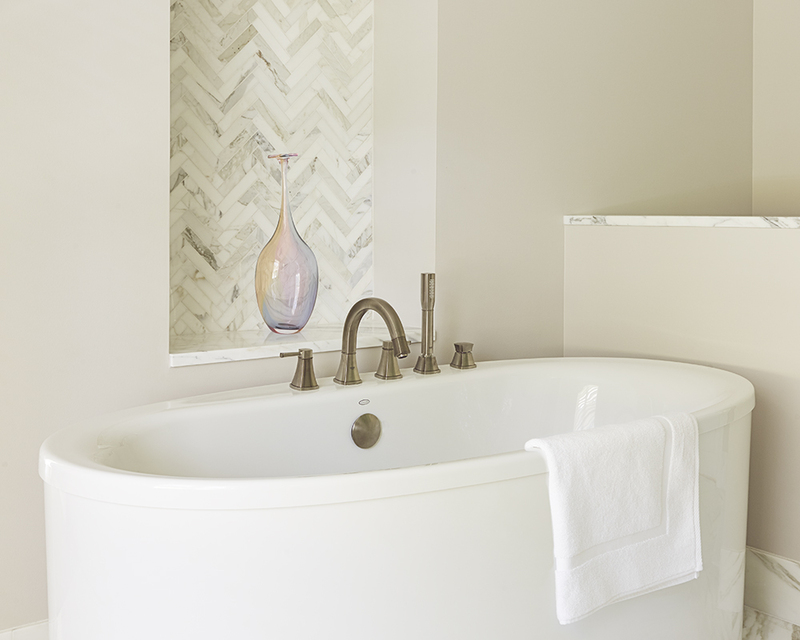 A wall niche above the tub features herringbone marble to match the vanity wall.